Fantastic three-storey house for 6 people and with private pool only 600 metres away from the beach in Can Picafort. If you are looking for a modern charming house with all the details, where you won't have to choose between the beach and the pool, this is your best choice! The two terraces around the private chlorine pool -that sizes 3 x 3 and with a water depth that ranges from 1.10 to 1.70 metres- are absolutely wonderful. One of the terraces is equipped with 4 sunloungers, and some exterior sofas and armchairs where you can bask in the sun or enjoy a good reading under the parasol. The other terrace features the barbecue and a table with chairs where you will enjoy your delicious meals alfresco under the sliding awning. And, amid all these plans, you still have to keep some time to visit the beach which only is a short walk away from the house.The interior is beautiful. The living-dining room features air-conditioning, an extendable table with chairs and, the best of all, a great sofa where you can take a good nap or watch the TV-Sat comfortably. The dream-like independent kitchen offers a ceramic hob, oven, a table with chairs for a quick breakfast or appetiser and direct exit to the exterior area -as well as the living room-. A toilet completes this floor and the washing machine, iron and ironing board also are here. The bedrooms are on the first floor. All of them have AC, a ceiling fan and a closet. One has a double bed and the other two have twin beds together -one of them with an en-suite with independent shower and tub-. There are two more shower bathrooms, one on the first floor and the other on the second floor where there also is an amazing living room with AC and exit to another furnished terrace. There is one more fan available as well as a radiator and a baby cot and high-chair.The house is only 600 metres away from the sea in Can Picafort so you will hit it in a short walk. The promenade is the perfect place to walk whilst enjoying an ice-cream or a cold drink, stopping now and then in shops and restaurants. If you feel like playing golf, the nearest course is the one of Alcanada, about 15 km away.The holding of events is forbidden.Pets are not allowed.Consult the advertiser for possible additional charges.DistancesBeach: 0.600 km - Ca'n PicafortAirport: 60 km - Son Sant JoanGolf course: 14.5 km - Alcanada GolfTown: 0.01 km - Ca'n PicafortTrain station: 15.2 km - Sa PoblaBus stop: 0.50 km - Ca'n PicafortFerry: 13.2 km - Puerto de AlcúdiaHospital: 27.4 km - Hospital Comarcal de IncaTourist license: ETVPL/12505There's a mandatory tourist tax in Balearic Islands, called Ecotasa. All guests, except people under 16 years, have to pay this tax. The amount varies between 0.55€/night and guest during the low season and 2.2€/night and guest during the high season and is reduced by half from the 9th day for your stay. Guests will receive an email 7 days prior to arrival with mandatory general deposit payment information. The deposit is payable by credit card via a secure link within 24 hours after receiving the email. For more details, please contact the office using the information on the reservation confirmation received after booking. Option booking not available Please note: the rates do not include the mandatory hirers' liability insurance. This small amount is a percentage of the rental sum starting from 10 Euros per reservation. Terraced house for 4-5 people, close to the sea in Colonia de Sant Pere. You will spend a very nice holiday with your loved ones in this cozy chalet close to the sea. In the outside you will find a little terrace where you can read a book or have breakfast in the morning. There is a second terrace with a little chill-out to have a pleasant evening. There is an outside dining area attached available for 6 people where you will enjoy meals and dinners.The house is developed through three floors. On the ground floor, you will find a comfortable living room with a sofa to watch TV while you refresh with the air conditioning or enjoying the warmth of the chimney. The dining table is for 6 people. The independent kitchen has a vitro and all tools needed to cook comfortably. There is a bathroom with a shower to complete this floor. On the first floor you will find two bedrooms. One with double bed and the other with two single beds. Both feature a closet and are air-conditioned. There is another bathroom in this floor, also with a shower. Last bedroom is in floor -1 and it counts with a double bed. To complete this bedroom you will find two armchairs and a wood stove for the coldest days. If you are travelling with a baby, a cut and a high chair are also available. There are also a whasing machine, an iron and a iron board in the house.Colonia de Sant Pere is a quiet coastal village with a little beach, restaurants and bars, and it is ideal for a holiday with your family. The golden sandy beach ends in a modern promenade with benches and little bar terraces. Walking the promenade you will arrive to the neighbour Caló des Parral, with coarse-grained dark sand, crystal clear water and where Torrent de sa Font des Parral flows into the sea. You will be 10 kms away from Arta, where you will find all services and where you can visit its famous caves. If you like golf, you will find a beautiful course at Capdepera, just 20 kms away.Pets are not allowed. The holding of events is forbidden. Consult the advertiser for possible charges. DistanciesBeach: 0.6 km - Colònia de Sant PereAirport: 65 km - Son Sant JoanGolf course: 19 km - Capdepera GolfTown: 0.2 km - Colònia de Sant PereTrain station: 34 km - ManacorBus stop: 0.5 km - Colònia de Sant PereFerry: 27 km - Port d´AlcúdiaHospital: 33 km - ManacorTourist license: ETV/9379The Ecotasa (tourist tax) must be paid cash on site when checking in. The amount varies between 0.55€/night and guest during the low season and 2.2€/night and guest during the high season. The tax is reduced by half from the 9th day of your stay. All guests have to pay the Ecotasa, except people under 16 years. You will have to pay the deposit amount at the arrival to the owner. Guests will receive an email 7 days prior to arrival with mandatory general deposit payment information. The deposit is payable by credit card via a secure link within 24 hours after receiving the email. For more details, please contact the office using the information on the reservation confirmation received after booking. Option booking not available Please note: the rates do not include the mandatory hirers' liability insurance. This small amount is a percentage of the rental sum starting from 10 Euros per reservation. The exterior area is wonderful. There is a beautiful chlorine pool sizing 8 x 4 metres and with a water depth that goes from 0.2 to 1.7 metres, as well as a furnished porch next to it where you can enjoy the good weather by a glass of wine. You will also find 6 sun loungers in order to bask in the sun and an exterior shower to quickly cool down. Another furnished porch with a table and chairs is perfect to your summer evening dinners and barbecues. The property, within a rural environment, is fenced and offers total privacy.Inside, the spacious living room open to the dining and kitchen, is the perfect room to be with your loved ones, family or friends. The space to rest and revell in the peace of the place is the seating area which is equipped with comfy sofas and TV-Sat. The kitchen boasts a Mallorcan style and features all you need to cook as if you were at home including a gas stovetop, oven and more. There are two large bedrooms in the house, one with a double bed and an en-suite bathroom with a tub and the other with twin beds. Both offer AC, closet and space for a baby cot. A high chair is also available. Then, there is a shower bathroom for the whole accommodation. The laundry room is independent and it has a washing machine, iron and ironing board. Finally, there are two fans available in case you need them. The location of this property is ideal to know the agriculture in the island. Vilafranca de Bonany is a small village where you will feel its charm everywhere, from the little grocery shops with local vegetables and fruits to the traditional Mallorcan bars and restaurants. On the contrary, Manacor - which is also very near- boasts more shops and a livelier atmosphere. The property is located between this two towns, 4.4 km away from Vilafranca and 7 km away from Manacor. If you want to visit the beach, the nearest one is in Porto Cristo, about 25.3 km away.Pets are not allowed.The holding of events is forbidden.Consult the advertiser for possible charges.There is exterior parking for 3 cars.DistancesBeach: 25.3 km - Porto CristoAirport: 37.7 km - Son Sant JoanGolf course: 14 km - Golf Reserva RotanaTown: 4.4 km - Vilafranca de BonanyTrain station: 9.6 km - ManacorBus stop: 5 km - Vilafranca de BonanyFerry: 48.5 km - PalmaHospital: 10.4 km - ManacorTourist license: ... There's a mandatory tourist tax in Balearic Islands, called Ecotasa. All guests, except people under 16 years, have to pay this tax. The amount varies between 0.55€/night and guest during the low season and 2.2€/night and guest during the high season and is reduced by half from the 9th day for your stay. The garden of this house is a real natural paradise that stands out because of its luxuriousness, beauty and life. Any moment becomes the perfect one to revell in the sun beams while having breakfast or a succulent barbecue that you can enjoy at the terrace or the porch. You can also sunbathe on the 7 sun loungers available, on the hammock or right on the lawn. If you are travelling with your children they will also have fun while running and playing in the garden. The property is fenced and, although there are neighbours around, privacy is total.The accommodation has two buildings: the main house and the annex.The big house offers spacious and simple spaces with a Mallorcan style that create the charming atmosphere that you need to relax as if you were at home. The great living - dining room welcomes you when you enter. It is perfect to chat with your loved ones or rest while watching the TV-Sat and cooling down with the AC. The kitchen offers a gas stovetop and all you need to cook, a table with chairs and exit to the outside. The laundry room offers a washing machine, iron and ironing board. There are 2 bathrooms, one with a shower and the other with a tub, and three bedrooms, two with double bed and one with twin beds and exit to the terrace. All of them present a closet and a fan. Two radiators also are available.The modern and well cared annex features a cosy living-dining-kitchen where you can watch TV or relax while cooking on the gas stovetop. You will also find a bedroom with a double bed, closet and fan, and a shower bathroom. We can prepare two baby cots and high chairs on request.Ses Covetes is a coastal area where you cannot miss the visit to the stunning beach of es Trenc, only 1.5 away from the property. You can enjoy a drink at any beach bar after a long day swimming in the crystalline water. The beach of Colonia de Sant Jordi is also like a dream, as many other beaches around. This town is also perfect to know the Mallorcan cuisine and for your daily shopping. Pets are not allowed.The holding of events is forbidden.Consult the advertiser for possible charges.There is exterior parking for 4 cars and covered exterior parking for 4 more cars.DistancesBeach: 1.5 km - Es TrencAirport: 39.2 km - Son Sant JoanGolf course: 28.5 km - Golf Son Antem-LlucmajorTown: 2.6 km - Ses CovetesTrain station: 36.3 km - ManacorBus stop: 3.2 km - Sa RàpitaFerry: 50.5 km - Puerto de PalmaHospital: 39.6 km - Hospital Comarcal Manacor Tourist license: ETV/2498The Ecotasa (tourist tax) must be paid cash on site when checking in. The amount varies between 0.55€/night and guest during the low season and 2.2€/night and guest during the high season. The tax is reduced by half from the 9th day of your stay. All guests have to pay the Ecotasa, except people under 16 years. This beautiful house is located only 150 metres away from the sea, so it is ideal to enjoy a delicious breakfast at the terrace and then have a long walk along the impressive rocky cliffs looking to the crystalline water before you reach the sandy beach of s'Illot, just 600 metres away. After the beach, you can go back home and enjoy a succulent barbecue alfresco together with a glass of wine while the family little ones have fun at the garden area around the house. The property is fenced and there are neighbours around.The inside surprises with its modern atmosphere but traditional at the same time, thanks to the modern building decorated with a varied furniture in both styles. The living-dining room is spacious and perfect to watch TV, relax on the sofa or maybe have fun with the little ones. The design kitchen is equipped with large countertops, induction top and oven, among many other utensils. The laundry room is independent and it offers a washing machine, iron and ironing board. There are two bathrooms with a shower in the house, and three bedrooms with a closet and a fan. One of them has a double bed and the other two come with twin beds. 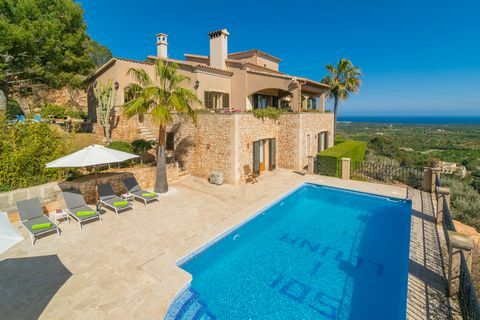 In addition, there are two baby cots and high chairs available.The location of the property is the best one for those who love the sea, and the dream-like beaches and coves because Cala Morlanda is only 200 metres away, s'Illot is about 600 metres away and Cala Rafalino is 750 metres away, among others. There are all kinds of services like bars, restaurants, grocery shops and more. Porto Cristo is also worth a visit specially if you are looking for a livelier place with more services, and you can make a boat excursion or visit the ancient Caves of Drach.The holding of events is forbidden.Pets are not allowed.Consult the advertiser for possible additional charges.DistancesBeach: 0.600 km - S'IllotAirport: 67 km - Son Sant JoanGolf course: 12 km - Pula GolfTown: 0.001 km - Cala MorlandaTrain station: 17.3 km - ManacorBus stop: 0.850 km - S'IllotFerry: 72 km - Puerto de PalmaHospital: 17.2 km - Hospital de ManacorTourist license: L12E2538The Ecotasa (tourist tax) must be paid cash on site when checking in. The amount varies between 0.55€/night and guest during the low season and 2.2€/night and guest during the high season. The tax is reduced by half from the 9th day of your stay. All guests have to pay the Ecotasa, except people under 16 years. Property Description Villa C’an Justo is a fantastic 3 bedroom villa in easy walking distance of the old town of Pollensa with its wonderful selection of traditional shops, bars and restaurants to suit all tastes and pockets. With mountain views and a very charming garden, the villa is located in a rural area just a few meters away from the Pollensa town entrance. The villa entrance leads directly into the large dining and living room that offers space and comfort for the whole family. The lounge area is most comfortably furnished and has wood burning stove, digital satellite TV and DVD player. The kitchen offers all the equipment needed for doing the perfect meals. This includes a dishwasher, ceramic hob, oven and microwave. A rear door opens onto a very attractive covered porch with barbecue and the whole area is furnished for dining out doors. All the rooms, including the living and dining area are air conditioned. The master double bedroom, located at one side, is equipped with a full en-suite bathroom. On the other side of the property there are two further pretty air-conditioned bedrooms, a double and a twin. These two bedrooms share a fantastic large shower with water jets incorporated in the wall. Outside the large covered porch is well furnished and the 8.5 metre pool is set amongst spacious terraces and gardens and has roman steps into a shallow end for children. There is a utility room by the pool which houses a WC, washing machine and laundry facilities. Villa holidays in Majorca and particularly holiday villas in Pollensa are excellent places for that perfect family holiday. This fantastic property offers a lot of comfort for a perfect holiday in Majorca and it is all fitted with our excellent villa service. The villa price includes pool and bath towels, every other day cleaning, towel change, a complementary welcome hamper pack at arrival, free WI-FI, Air-condition and 24 hour service to solve any doubts or problems. 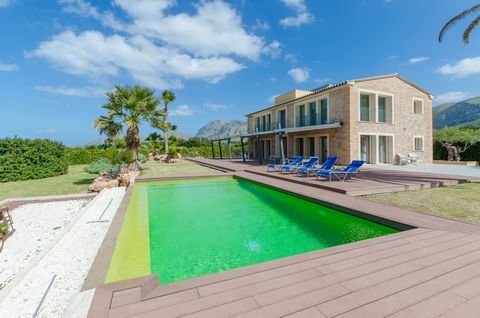 Property Description Located in one of the most exclusive areas in Puerto Pollensa, at only 100 meters away from the sea, this fantastic villa opens its doors to a wonderful holiday. A little entrance leads to the main areas of the house: At the right side there is the kitchen, well equipped and with a terrace and access to the outside BBQ. Forwards there is a corridor that takes to the three bedrooms and two bathrooms. The bedrooms are all full air conditioned. The main bedroom has a double bed (180m) whilst the other two bedrooms can be configured as doubles or as single bedrooms. The big bathroom, located next to the main bedroom has a very large bath as well as two sinks. The other bathroom is also equipped with two sinks and a bath. At the left side of the entrance there is the large living / sitting area, which has enough space to spend a lovely time at meals or watching the TV with channels in various languages, like English, German, Spanish, etc. as well as Netflix, WIFI and games. The living area has an access to the larger terrace and garden. This will be the favorite place of many, because it offers the comfort and the fun of enjoying the nice Mallorca weather at the sunbeds, or just at the lounge at the covered terrace. The sea is at only a few meters away from the villa. There is a table tennis at the terrace. The house is fully air conditioned (only not in the kitchen). There is central heating (for the colder months). The whole house is on one level, no stairs upstairs, just two steps at the entrance and down to the garden. Property Description This apartment is situated in the front row, next to the beach on the 4th floor with lift. Restaurants and supermarkets are just a few metres away, the sail and surfcenter is situated approx. 100 metres away, a tennis court is approx. 600 metres away. The golf course from Pollença can be reached at about 7 km. Ideally for everyone who wants to enjoy the marvelous views to the sea and the Puerto Pollença bay, also the comfortable, nearby restaurants, bars, cafés and shops. This modern furnished Penthouse offers a wonderful view to the bay with the yachting harbour and the mountains of Puerto Pollença. This quiet apartment is situated at the top, on the 4th floor. Of course, there is a lift. The flat has got a living room of approx. 180 sqm., adding a spacious roof sun terrace with grill, meal place, sunlounges and furnitures. Casa Ancla in Son Serra - Four Bedroom Villa, Sleeps 7. 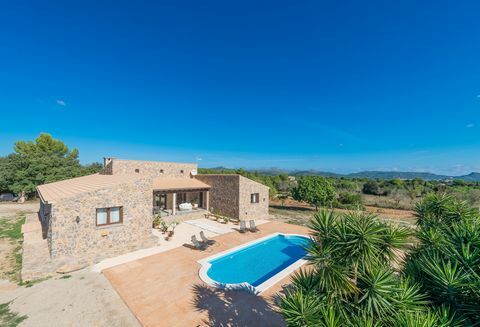 Finca Perotí in Manacor - Four Bedroom Cottage, Sleeps 8. Quiet getaway country house with private pool and beautiful views in Arta. Can Lluis is a country house located in a very quiet spot, in a hilly landscape with beautiful views over the countryside. Amidst the mountains and with amazing views to the village of s'Horta and the sea, this lovely house for 8 people with private pool welcomes you. The exterior area of this house is extraordinary. Just in front of the beautiful stone building you have the wonderful private chlorine pool -sizing 8 x 4 metres and with a water depth that goes from 1.3 to 2.3 metres- surrounded by 8 sun loungers and several parasols where you can enjoy the sun or a good reading beneath the shade. Right here as well as at gravel area at the back and the two porches, you have tables and chairs enough to enjoy a delicious breakfast or succulent barbecues to be enjoyed while you admire the sea views. Then you have a ping-pong table to have a nice time. The property is fenced and there ar neighbours around.The house comprises three floors. The main floor offers a comfy living-dining room where you can relax while watching the TV-Sat, or having lunch or dinner with your family or friends. Next, the kitchen surprises with its Majorcan style and it offers a gas cooktop, oven and room for meals here too. Then, a toilet and a bedroom with a double bed and an en-suite bathroom with a bath complete this level. When you climb the stairs you find another shower bathroom and a second bedroom with a double bed. And the floor -1 offers a bathroom with a bath and two more bedrooms, both with twin beds. All bedrooms have AC, closet (but one on the -1 level) and exit to the terrace (except the one of the 1st floor). The utility room is independent and it features a tumble dryer, washing machine, iron and ironing board. The whole house is equipped with oil central heating. And if you are travelling with your baby we can prepare a cot and a high-chair.The property emanates peace and natures all around, so it is ideal for those who look for quietness and taking long walks around a natural environment. Nevertheless, the town of s'Horta is about 800 metres away and here you will find the basic services. The beach is only 5 km away, being the nearest one the beach of Cala Marçal.Pets are not allowed.The holding of events is forbidden.Consult the advertiser for possible additional charges.There is exterior parking for 4 cars.DistancesBeach: 5 km - Cala MarçalAirport: 51.4 km - Son Sant JoanGolf course: 42.3 km - Golf CanyamelTown: 0.800 km - S'HortaTrain station: 24 km - ManacorBus stop: 0.80 km - S'HortaFerry: 63 km - Puerto de PalmaHospital: 24.5 km - Hospital de ManacorTourist license: ETV/1741The Ecotasa (tourist tax) must be paid cash on site when checking in. The amount varies between 0.55€/night and guest during the low season and 2.2€/night and guest during the high season. The tax is reduced by half from the 9th day of your stay. All guests have to pay the Ecotasa, except people under 16 years. Guests will receive an email 7 days prior to arrival with mandatory general deposit payment information. The deposit is payable by credit card via a secure link within 24 hours after receiving the email. For more details, please contact the office using the information on the reservation confirmation received after booking. Option booking not available Please note: the rates do not include the mandatory hirers' liability insurance. This small amount is a percentage of the rental sum starting from 10 Euros per reservation. 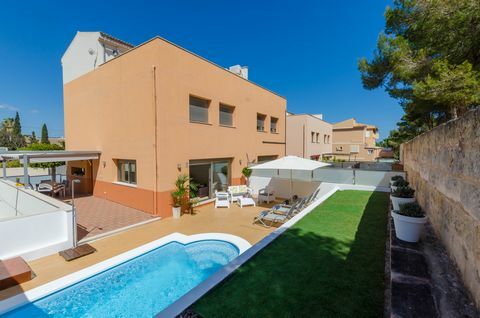 Welcome to this impressive and modern town house in sa Pobla that offers accommodation for 5 people. The main terrace of this house becomes the perfect place to relax enjoying a delicious breakfast or basking in the sun on one of the two sun loungers, before leaving to visit the island all day long. When you come back, you also can taste a succulent dinner alfresco in the summer evenings. Then, there is a second terrace upstairs, accessible from one of the bedrooms, that invites to enjoy a flute of champagne under the starry sky.The house offers spacious and comfy rooms. When you enter you find a fabulous space with the living room -with TV set-, the dining room and the kitchen all together. The kitchen is equipped with a ceramic hob, oven, all you need to cook and an island with stools that gives a special touch to this space. The utility room features a washing machine, a tumble dryer, an iron and an ironing board. The main floor is completed with a toilet (the shower in it is not available). Then upstairs you reach a second living area and the three bedrooms. The first room has a double bed, air-conditioning, closet, space for a baby cot (a high-chair can also be provided) and an en-suite bathroom with a shower. The second bedroom also has a double bed, air-conditioning, a cloths rack and a dresser and exit to the terrace. The last bedroom offers a single bed and a dresser. Finally, there is a bathroom with a tub on this floor.The accommodation is located a few metres away from the centre of sa Pobla where you will find lots of traditional bars and restaurants. Its street market is on Sunday morning and here you can buy local fruits, vegetables and other products. You will have to drive about 15 minutes to reach the beaches in the north like Son Serra de Marina, Playa de Muro and Can Picafort. 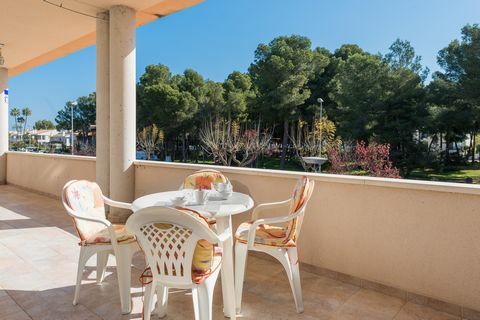 The nearest golf course is in Pollensa about 10 km away in case you want to spend a different kind of day.The holding of events is forbidden.Pets are not allowedConsult the advertiser for possible additional charges.There is parking space for 1 car in the garage.DistancesBeach: 21.2 km - Son Serra de MarinaAirport: 57 km - Son Sant JoanGolf course: 10 km - Golf PollençaTown: 0.01 km - Sa PoblaTrain station: 1.5 km - Estación de Sa PoblaBus stop: 0.55 km - Ronda Nord, Sa PoblaFerry: 14 km - Puerto de AlcúdiaHospital: 12 km - Hospital Comarcal de Inca Guests will receive an email 7 days prior to arrival with mandatory general deposit payment information. The deposit is payable by credit card via a secure link within 24 hours after receiving the email. For more details, please contact the office using the information on the reservation confirmation received after booking. Option booking not available Please note: the rates do not include the mandatory hirers' liability insurance. This small amount is a percentage of the rental sum starting from 10 Euros per reservation. Welcome to this wonderful apartment for 2 people located just 140 metres away from the amazing beach of Puerto de Alcudia. The recently renewed apartment in a modern style and exceptional taste counts with a small, furnished terrace, where you can feel the sea breeze while you have breakfast, a real privilege. Then you can spend the day at the beach of fine sand and crystal-clear water, which only is a few steps away. When you come back in the evening, you can enjoy a glass of wine whilst admiring the sunset. This small but cosy apartment located on the first floor of a building with no lift surprises with its modern style. When you enter you find a living room comprising a dining area, a sofa, satellite-TV and a kitchenette, equipped with a small fridge, a vitro hob, a microwave and some crockery. You can watch the TV-Sat and chat whilst you cook your meals. The bedroom has twin beds together, a closet, AC, direct access to the terrace and a beautiful en-suite bathroom with a shower. We can provide with a cot and a high-chair if you are travelling with your baby. And of course, you will find a washing machine, iron and ironing board.The location is perfect because everything is in a walk distance. There are lots of restaurants, bars, shops and supermarkets, bus stop and much more. The beach of Puerto de Alcudia is a real paradise or crystal-clear water, white sand and it's about 7 km long skirting the coast so that you can not only sunbathe and swim but also enjoy long walks and admire the sunset. If you fancy a cultural visit we recommend you visit the historical centre of Alcudia with the pebbled streets, the church, the impressive Medieval walls and the street market that takes place on Tuesdays and Sundays. Pets are not allowed. The holding of events is forbidden. Consult the advertiser for possible charges. Distances: Beach: 0.140 km - Puerto de AlcúdiaAirport: 60.2 km - Son Sant JoanGolf course: 6.5 km - AlcanadaTown: 3.4 km - AlcúdiaTrain station: 12.5 km - Sa PoblaBus stop: 0.210 km - Puerto de AlcúdiaFerry: 4.3 km - Puerto de AlcúdiaHospital: 25.1 km - Hospital Comarcal d'IncaTourist license: 2859/2018There's a mandatory tourist tax in Balearic Islands, called Ecotasa. All guests, except people under 16 years, have to pay this tax. The amount varies between 0.55€/night and guest during the low season and 2.2€/night and guest during the high season and is reduced by half from the 9th day for your stay. Guests will receive an email 7 days prior to arrival with mandatory general deposit payment information. The deposit is payable by credit card via a secure link within 24 hours after receiving the email. For more details, please contact the office using the information on the reservation confirmation received after booking. Option booking not available Please note: the rates do not include the mandatory hirers' liability insurance. This small amount is a percentage of the rental sum starting from 10 Euros per reservation. Welcome to this great apartment for 3 people located on a ground floor and only 350 metres away from the beach in Puerto de Alcudia. 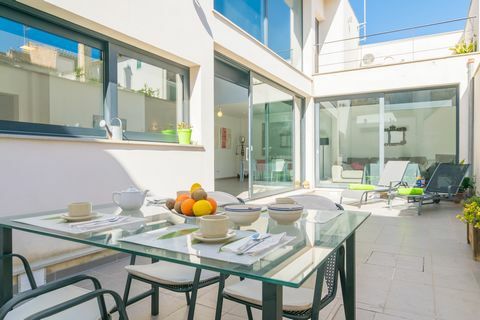 The terrace of this wonderful apartment invites to enjoy a delicious and energising breakfast every morning before heading for the beach to spend a great day. Prepare some toasts with jam, an OJ, a coffee or tea and get the energy to have a short walk to the crystal-clear waters of the amazing beach of Puerto de Alcudia. When you come back, yo can organise an appetiser by a glass of wine before dining. The inside offers a spacious open plan room combining the living, the dining and the kitchen. With two AC units, this room invites to spend family time as long as you want. You can watch the TV-Sat, chat, enjoy, planning your stay or enjoying your meals that you can cook on the ceramic hob or the oven. The washing machine, iron and ironing board are in the kitchen area. There are two comfortable bedrooms where you can rest at night, both with a closet. One has a double bed and the other has twin beds. We can provide a baby cot and a high-chair if you are travelling with your little one. There is one shower bathroom for the whole accommodation. Two fans complete the equipment.Puerto de Alcudia is the perfect place for those who love the beach, specially, one with all the needed services around to spend a wonderful vacation. The paradisaical and long beach is only 350 metres away from the accommodation. When you com back, just have a shower and head out to taste a delicious ice-cream or a dinner in a good restaurant. If you want have a different kind of day, you have the golf course of Alcanada just 7.5 km away.The holding of events id forbidden.Pets are not allowed.Consult the advertiser for possible additional charges.DistancesBeach: 0.35 km - Puerto de AlcúdiaAiport: 61 km - Son Sant JoanGolf course: 7.5 km - Golf AlcanadaTown: 0.01 km - Puerto de AlcúdiaTrain station: 11.4 km - Sa PoblaBus stop: 0.20 km - Puerto de AlcúdiaFerry: 2.5 km - Puerto de AlcúdiaHospital: 26 km - Hospital Comarcal de IncaTourist license: ETVPL/12884There's a mandatory tourist tax in Balearic Islands, called Ecotasa. All guests, except people under 16 years, have to pay this tax. The amount varies between 0.55€/night and guest during the low season and 2.2€/night and guest during the high season and is reduced by half from the 9th day for your stay. Guests will receive an email 7 days prior to arrival with mandatory general deposit payment information. The deposit is payable by credit card via a secure link within 24 hours after receiving the email. For more details, please contact the office using the information on the reservation confirmation received after booking. Option booking not available Please note: the rates do not include the mandatory hirers' liability insurance. This small amount is a percentage of the rental sum starting from 10 Euros per reservation. In this great Finca Hotel, 2 guests will revell in the nature and peace. It's located on the outskirts of Inca and it offers a wonderful shared pool. Amid a natural surrounding full of trees and greenery, this wonderful Finca Hotel features a shared chlorine pool encircled by the lawn, that invites to spend a great day swimming with the only company of the birds singing. The pool sizes 11 x 7 metres and it has a water depth that goes from 1 to 2.5 metres. There also are 6 sun loungers in order to bask in the sun for a while and an exterior shower. In the evening, the exterior corners around the place are perfect for a nice walk.The Finca Hotel features a comfortable living area for all guests to rest and enjoy a good chat all together as well as a dining room where you will enjoy breakfast every morning, which is included in the price.The room is located on the first floor. The superior category room boasts a beautiful Mallorcan style and offers a double bed, an en-suite bathroom with an independent bath and shower and room enough for a baby cot and a high-chair. There is oil central heating for the winter season.Inca is a beautiful city in the centre of the Mallorca. Its location is perfect to be the starting point for your excursions throughout Mallorca, either to the beach like Puerto de Alcudia or Playa de Palma, or to the Tramuntana mountain range. The city has all the needed services for an independent stay like supermarkets, restaurants, bars and shops. Finally, you cannot miss the weekly street market in the town centre that takes place on Thursdays.Pets are not allowed.The holding of events is forbidden.Contact the advertiser for possible additional charges.There is exterior parking for 4 cars,The pool is open from 8 am to 8.30 pm.DistancesBeach: 17.9 km - Puerto de AlcúdiaAirport: 43 km - Son Sant JoanGolf course: 26 km - Golf AlcanadaTown: 3 km - IncaTrain station: 5.5 km - IncaBus stop: 3.5 km - IncaFerry: 25 km - Puerto de AlcúdiaHospital: 3.5 km - Hospital Comarcal de IncaTourist license: AT-033-BALThere's a mandatory tourist tax in Balearic Islands, called Ecotasa. All guests, except people under 16 years, have to pay this tax. The amount varies between 0.55€/night and guest during the low season and 2.2€/night and guest during the high season and is reduced by half from the 9th day for your stay. Guests will receive an email 7 days prior to arrival with mandatory general deposit payment information. The deposit is payable by credit card via a secure link within 24 hours after receiving the email. For more details, please contact the office using the information on the reservation confirmation received after booking. Option booking not available Please note: the rates do not include the mandatory hirers' liability insurance. This small amount is a percentage of the rental sum starting from 10 Euros per reservation. Enjoy the charm of the interior of the island in this fantastic Finca Hotel with shared pool on the outskirts of Inca where 2 guests will enjoy nature and peace. The excellent shared exterior area highlights the presence of the impressive lawn of which centre offers a beautiful chlorine shared pool that sizes 11 x 7 metres and has a water depth ranging from 1 to 2.5 metres. Here, you can swim after basking in the sun on your towel on the lawn or on any of the 6 sun loungers available. There also is an exterior shower and other areas which are perfect to enjoy the natural surroundings when taking a walk.This Finca Hotel features a comfortable living area for all the guests to rest and relax, as well as a dining area where they can have breakfast every morning since it's included in the price.You will find your room on the first floor. The standard category room is decorated in a traditional Mallorcan style that can be seen in the furniture as in the frame of the twin beds or in the armchairs. There also is room enough for a baby cot and a high-chair. It has a private bathroom with a bathtub located on the room corridor. And there is oil central heating for the winter season.Inca is a beautiful city in the centre of the island. Its location is perfect as starting point to head for any point, either for the beach, like Puerto de Alcudia or Playa de Palma, or for the mountain, in this case the protected mountain range of Tramuntana. The town offers all services for an independent stay like supermarkets, bars, restaurants and shops. And the street market that takes place on Thursdays along the town centre also is worth a visit. Pets are not allowed.The holding of events is forbidden.Contact the advertiser for possible additional charges.There is exterior parking for 4 cars,The pool is open from 8 am to 8.30 pm.DistancesBeach: 17.9 km - Puerto de AlcúdiaAirport: 43 km - Son Sant JoanGolf course: 26 km - Golf AlcanadaTown: 3 km - IncaTrain station: 5.5 km - IncaBus stop: 3.5 km - IncaFerry: 25 km - Puerto de AlcúdiaHospital: 3.5 km - Hospital Comarcal de IncaTourist license: AT-033-BALThere's a mandatory tourist tax in Balearic Islands, called Ecotasa. All guests, except people under 16 years, have to pay this tax. The amount varies between 0.55€/night and guest during the low season and 2.2€/night and guest during the high season and is reduced by half from the 9th day for your stay. Guests will receive an email 7 days prior to arrival with mandatory general deposit payment information. The deposit is payable by credit card via a secure link within 24 hours after receiving the email. For more details, please contact the office using the information on the reservation confirmation received after booking. Option booking not available Please note: the rates do not include the mandatory hirers' liability insurance. This small amount is a percentage of the rental sum starting from 10 Euros per reservation. Welcome to this wonderful, cosy and modern house for 4 people located on the seafront in Colonia de Sant Pere. 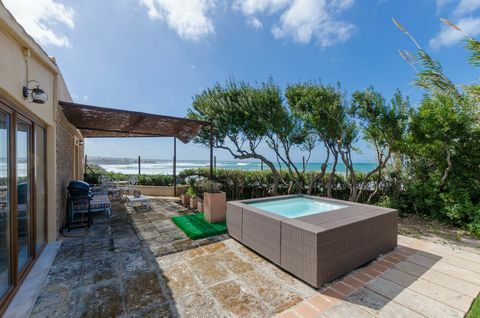 The spectacular views to the sea which just is in front of the house, together with the beautiful mountain landscape at the end become the perfect scenery to enjoy a relaxing bath in the cold water jacuzzi at the terrace. Next to it you have an artificial lawn that invites to sunbathe on one of the 4 sun loungers or simply enjoy a good reading in peace. Then, you can head for the beach to swim in the salt water and wash off when you come back under the spray of the exterior shower before cooking a delicious barbecue at any of the 2 terraces. One of them will allow you to admire the movement of the waves and the other is at the back side, and both are perfect to enjoy a flute of champagne at night. The property is fenced and there are neighbours around.The house works with solar panels and boasts a specially beautiful interior. The living area is perfect for a rest, watch the TV-Sat or chat all together. Then you access the dining-kitchen which is equipped with a gas cooktop, oven and all you need for your meals. Right here you will find the washing machine, the iron and the ironing board. There are two bedrooms where you can rest at night, one with a double bed and room for a baby cot and the other with twin beds. A high-chair also can be provided. There is one bathroom with a shower for the whole accommodation. You will also have two fans available.Colonia de Sant Pere is the perfect coastal village for those who love a peaceful vacation although with all the needed services nearby, like bars, restaurants and the beach, of course. This is in fact a real paradise of crystal clear waters and fine sand. And if you like playing golf, the course of Canyamel Golf is only 20 km away.Pets are not allowed.The holding of events is forbidden.Consult the advertiser for possible additional charges.There is parking space for 1 car.DistancesBeach: 0 km - Cala de S'EstretAirport: 71.3 km - Son Sant JoanGolf course: 20 km - Canyamel GolfTown: 1 km - Colònia de Sant PereTrain station: 23.3 km - ManacorBus stop: 1.3 km - Colònia de Sant PereFerry: 28.9 km - Puerto de AlcúdiaHospital: 23.4 km - Hospital de ManacorTourist license: ETV/11237The Ecotasa (tourist tax) must be paid cash on site when checking in. The amount varies between 0.55€/night and guest during the low season and 2.2€/night and guest during the high season. The tax is reduced by half from the 9th day of your stay. All guests have to pay the Ecotasa, except people under 16 years. You will have to pay the deposit amount at the arrival to the owner. Guests will receive an email 7 days prior to arrival with mandatory general deposit payment information. The deposit is payable by credit card via a secure link within 24 hours after receiving the email. For more details, please contact the office using the information on the reservation confirmation received after booking. Option booking not available Please note: the rates do not include the mandatory hirers' liability insurance. This small amount is a percentage of the rental sum starting from 10 Euros per reservation. Enjoy your deserved vacation in a modern oasis in the middle of the fields in Artà, with private pool and capacity for 4 people. The peaceful surroundings of this house will allow you to forget the hustle and bustle of your daily life. The sound of the fields and nature will be your best company every day while you enjoy a delicious breakfast at the porch. Afterwards, the best plan is to spend the day by the chlorine pool, enjoying the atmosphere and the company of your loved ones. It sizes 10 x 4 metres while its water depth ranges from 1.5 to 1.6 metres. After the cool dip you can spend a time in the integrated jacuzzi. If you feel like sunbathing, there are 8 sun loungers to bask in the sun. Finally, you can end your day enjoying succulent grilled vegetables and meats cooked on the gas barbecue. The property is fenced and there are neighbours around.The house features just one floor with a modern style although rustic at the same time, working with solar panels. When you enter, a great living - dining room welcomes you and is perfect for your family meals. You can relax on the sofa or armchairs while you watch the satellite TV, read or listen to music. It also includes a chimney which is perfect to be warm when it's cold outside. The modern island offers a great island with stools, stainless steel appliances like oven, microwave and gas cooktop, among others. The washing machine, iron and ironing board also are here. When it's time to go to bed, our guests will choose among 3 bedrooms, one with a small double bed, and the other two bedrooms with twin beds, all of them with closet and fan. We can prepare a cot and a high chair if you are travelling with your baby. Finally, there are two bathrooms in the house, one with a shower and the other with independent shower and jetted tub.The finca is located in a quiet area on the outskirts of Artà, about 3.2 km away. So, you will be able to enjoy not only the nature and peace around but also all the needed services for an independent stay like supermarkets and traditional bars and restaurants where you can taste the Mallorcan recipes. The location also offers an easy and quick access to the eastern beaches like Costa dels Pins which is the nearest one, about 11.5 km away, and other dream-like beaches. You can also give golf a try, being the nearest course only 8.3 km away in Capdepera.There is exterior parking for 4 cars.Pets are not allowed.The holding of events is forbidden.Consult the advertiser for possible charges. The water in the jacuzzi cannot be heated.DistancesBeach: 11.5 km - Costa des PinsAirport: 64.3 km - Son Sant JoanGolf course: 8.3 km - Golf de CapdeperaTown: 3.2 km - ArtàTrain station: 19 km - Estación de ManacorBus stop: 3.6 km - ArtàFerry: 74.5 km - Puerto de PalmaHospital: 17.8 km - Hospital de ManacorTourist license: ETV/12090The Ecotasa (tourist tax) must be paid cash on site when checking in. The amount varies between 0.55€/night and guest during the low season and 2.2€/night and guest during the high season. The tax is reduced by half from the 9th day of your stay. All guests have to pay the Ecotasa, except people under 16 years. Guests will receive an email 7 days prior to arrival with mandatory general deposit payment information. The deposit is payable by credit card via a secure link within 24 hours after receiving the email. For more details, please contact the office using the information on the reservation confirmation received after booking. Option booking not available Please note: the rates do not include the mandatory hirers' liability insurance. This small amount is a percentage of the rental sum starting from 10 Euros per reservation. Welcome to this fantastic apartment located 140 metres away from the lovely beach of Puerto de Alcudia where 2 guests find their second home. 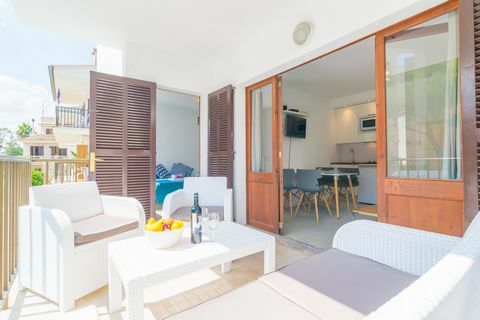 Recently renewed with a great taste and modern style, this apartment offers a cosy furnished little terrace which will become the perfect corner to enjoy a good glass of wine and an appetiser whilst you admire the sunset and feel the sea breeze. But all of it, after having spend a great and long day at the beach, swimming in the crystal-clear water.The apartment is located on a second floor without elevator. The modern furniture and freshness will make you feel at home. When you enter you find a space that combines the living area with the dining and the kitchen. This is very helpful since you can sit to watch TV, cook and set the table, all at the same time and all together. The simple kitchenette features the basics: microwave, ceramic hob, a small fridge and cutlery. The bedroom offers twin beds set together, closet, AC, access to the terrace and a beautiful en-suite bathroom with a shower. If you are travelling with your baby we can prepare a cot and a high-chair. Finally, the accommodation has a washing machine, an iron and an ironing board.The location is perfect because you will reach everywhere on foot. There are lots of restaurants as well as bars, grocery and fashion shops, supermarkets, bus stop and more. The beach in Puerto de Alcudia is a paradise of crystalline waters and white sand with more than 7 km long, so you can have a long walk along admiring the sunset. The beach also is perfect for children thanks to the shallow waters. We also recommend you vist the town centre of Alcudia, with its narrow streets and the medieval wall around where the street market takes place every Tuesday and Sunday. Pets are not allowed. The holding of events is forbidden. Consult the advertiser for possible charges. Distances: Beach: 0.140 km - Puerto de AlcúdiaAirport: 60.2 km - Son Sant JoanGolf course: 6.5 km - AlcanadaTown: 3.4 km - AlcúdiaTrain station: 12.5 km - Sa PoblaBus stop: 0.210 km - Puerto de AlcúdiaFerry: 4.3 km - Puerto de AlcúdiaHospital: 25.1 km - Hospital Comarcal d'IncaTourist license: 2859/2018There's a mandatory tourist tax in Balearic Islands, called Ecotasa. All guests, except people under 16 years, have to pay this tax. The amount varies between 0.55€/night and guest during the low season and 2.2€/night and guest during the high season and is reduced by half from the 9th day for your stay. Guests will receive an email 7 days prior to arrival with mandatory general deposit payment information. The deposit is payable by credit card via a secure link within 24 hours after receiving the email. For more details, please contact the office using the information on the reservation confirmation received after booking. Option booking not available Please note: the rates do not include the mandatory hirers' liability insurance. This small amount is a percentage of the rental sum starting from 10 Euros per reservation. Amidst the sea and the mountains in Colonia de Sant Pere, this amazing villa with private pool becomes a little paradise for 6 - 8 guests. It is impossible to think a better way to start the day than having breakfast by the private chlorine pool of this stunning house while you admire views to the sea. Then, a real paradise will surround you while you enjoy a nice swim. The greenish of the pool contrasts with the blue of the sea, offering the perfect match along its 8 x 4 metres and its 1 to 1.7 metres water depth. It is surrounded by a beautiful wooden flooring with 8 sun loungers and a lawn area that almost reaches the sea. There also is an exterior shower where you can wash the salt off when you come back from the beach before cooking an exquisite barbecue under the covered terrace. The property is fenced and there are neighbours.The majestic building comprises 3 floors, and you will be happy to know that it works with solar energy. You will be welcomed by a spacious living room, open to the dining area and the kitchen. The living invites to spend your time chatting or watching the TV-Sat while the dining is perfect for a delicious family banquet. The kitchen, located at the end, offers a gas cooktop on an island with stools, space to cook, oven and much more. There is a shower bathroom still on the main floor. When you climb the staircase you find the three bedrooms, all of them with a fan. One has a double bed, space for a baby cot (a high-chair also can be provided), a walk-in closet and an en-suite bathroom with independent shower and jetted tub. The other two bedrooms have twin beds and an en-suite shower bathroom each. The two extra guests will sleep in a double folding bed. The -1 level features the garage where there is a gym and a ping-pong table. The utility room has a washing machine, tumble dryer, iron and ironing board.Colonia de Sant Pere is a quiet coastal village with beach, restaurants and bars, perfect for a peaceful vacation. The beach will be the oasis of those who love crystal-clear waters and fine sand. And if you like playing gold you find the next course only 20 km away, the Canyamel Golf.Pets are not allowed.The holding of events is forbidden.Consult the advertiser for possible additional charges.There is parking space for 4 cars in the garage.DistancesBeach: 0.180 km - Cala de S'EstretAirport: 71.2 km - Son Sant JoanGolf course: 20 km - Canyamel GolfTown: 1 km - Colònia de Sant PereTrain station: 23.3 km - ManacorBus stop: 1.3 km - Colònia de Sant PereFerry: 28.9 km - Puerto de AlcúdiaHospital: 23.7 km - Hospital de ManacorTourist license: ETV/2141The Ecotasa (tourist tax) must be paid cash on site when checking in. The amount varies between 0.55€/night and guest during the low season and 2.2€/night and guest during the high season. The tax is reduced by half from the 9th day of your stay. All guests have to pay the Ecotasa, except people under 16 years. You will have to pay the deposit amount at the arrival to the owner. Guests will receive an email 7 days prior to arrival with mandatory general deposit payment information. The deposit is payable by credit card via a secure link within 24 hours after receiving the email. For more details, please contact the office using the information on the reservation confirmation received after booking. Option booking not available Please note: the rates do not include the mandatory hirers' liability insurance. This small amount is a percentage of the rental sum starting from 10 Euros per reservation. Within a spectacular and privileged area and mountain surroundings, this beautiful country house with private pool on the outskirts of Andratx welcomes 8 guests. Any exterior corner of this beautiful finca is incomparable thanks to the natural atmosphere and to the even more amazing views to the mountains and the sea in Andratx. Can you imagine your breakfasts and barbecues at the terrace, your relaxed moments whilst basking in the sun on the 8 sun loungers or the Bali bed, or even better, whilst swimming in the beautiful private chlorine pool? The pool sizes 10 x 5 metres and it has 2 metres water depth with a wonderful turquoise colour. There is an exterior shower in case you need it. The property is fenced and privacy is partial since there is a direct neighbour.The two-storey house boasts a lovely rustic style that you can see in the stone walls. The main floor offers a spacious living-dining room where you can enjoy your meals all together and then rest while watching the TV-Sat. The kitchen, on the other side, offers a lot of space to cook, a gas cooktop, oven and a table with chairs in case you prefer to have lunch in here. The washing machine, iron and ironing board also are here. The house has 4 bedrooms to rest at night, all of them with a closet and a fan. Two of the bedrooms -still on this floor- have a double bed and exit to the terrace. One of them also offers an en-suite bathroom with a shower. The other two bedrooms are upstairs and have twin beds. One of them also has an en-suite bathroom with a bath. A second bathroom with a shower and a great living room with exit to another terrace complete the first floor. A baby cot and high chair as well as a radiator complete the equipment.The property is located in the hill of Puig de Garrafa and within a plot of 14000 m2 full of olive trees, cypresses and more trees that will make you spend a great time while having a walk throughout. A a few minutes drive leads to the beach, either Camp de Mar, Platja Palmira or Cala Fornells. The centre of Andratx is about 5 km away and offers all needed services for an independent stay. Finally, we recommend you visit Puerto de Andratx at night where you while enjoy the luxury and extravagance of the area while having dinner in a great restaurant and having a walk through the marina afterwards.The holding of events is forbidden.Pets are not allowed.Consult the advertiser for possible additional charges.There is exterior parking for 2 cars in the property.DistancesBeach: 3.3 km - Platja Camp de MarAiport: 43.8 km - Son Sant JoanGolf course: 3.1 km - Golf d'AndratxTown: 5 km - AndratxTrain station: 30 km - PalmaBus stop: 5 km - AndratxFerry: 26.8 km - PalmaHospital: 27.8 km - Son EspasesTourist license: ETV/7253The Ecotasa (tourist tax) must be paid cash on site when checking in. The amount varies between 0.55€/night and guest during the low season and 2.2€/night and guest during the high season. The tax is reduced by half from the 9th day of your stay. All guests have to pay the Ecotasa, except people under 16 years. You will have to pay the deposit amount at the arrival to the owner. Guests will receive an email 7 days prior to arrival with mandatory general deposit payment information. The deposit is payable by credit card via a secure link within 24 hours after receiving the email. For more details, please contact the office using the information on the reservation confirmation received after booking. Option booking not available Please note: the rates do not include the mandatory hirers' liability insurance. This small amount is a percentage of the rental sum starting from 10 Euros per reservation. Wonderful country house for 6 guests offering a private pool and being part of a mountain field and surrounding on the outskirts of Andratx. All corners belonging to the exterior area of this finca are incomparable since they are surrounded by pure nature. However, the amazing views to the sea and mountains of Andratx will surprise you even more. You can get up every morning and enjoy a delicious breakfast at the terrace and get energy to spend the day sunbathing on the sun loungers, maybe with a drink on the Bali bed or swimming in the private chlorine pool. The turquoise water tank sizes 10 x 5 metres and has a 2 metres depth. There is an exterior shower for a quick wash off outdoors. The property is fenced and privacy is partial because there is a direct neighbour.The Mallorcan warm stone house comprises two floors. When you enter you find a great living - dining room where you can enjoy your meals all together, chat or watch the satellite TV. The kitchen, open on the other side, offers a gas cooktop, oven, a lot of space to work and a table with chairs. You will find the washing machine, iron and ironing board also here. On the first floor you have a second living room to maybe spend some time of solitude and enjoy the views from its terrace. There are three rooms where you can rest, all of them with a closet and a fan. One is on the main floor and it has a double bed, an en-suite bathroom with a shower and direct exit to the terrace. On the first floor we find the other two bedrooms, both with twin beds and one of them with an en-suite bathroom with a bathtub. Then, there is a second bathroom -with a shower- on this floor for the rest of the house. A baby cot and a high-chair, together with a radiator also are available.The property is located within a 14000 m2 plot full of cypresses, olive and other kinds of trees spreading along the hill of Puig de Garrafa that invite to take a walk throughout. If you fancy going to the beach, the nearest one is 4 km away in Camp de Mar, but there are many other beaches which are worth a visit like Cala Fornells. The centre of Andratx is about 5 km away and offers the basic services for your stay. And in order have fan you can head for the golf course about 3 km away and for Puerto de Andratx at night where you can have dinner and walk among luxurious yachts and boats.Pets are not allowed.The holding of events is forbidden.Consult the advertiser for possible additional charges.There is exterior parking for 2 cars in the property.DistancesBeach: 3.3 km - Playa Camp de MarAirport: 43.8 km - Son Sant JoanGolf course: 3.1 km - Golf AndratxTown: 5 km - AndratxTrain station: 30 km - Estación Intermodal de PalmaBus stop: 5 km - AndratxFerry: 26.8 km - Puerto de PalmaHospital: 27.8 km - Hospital Son EspasesTourist license: ETV/7253The Ecotasa (tourist tax) must be paid cash on site when checking in. The amount varies between 0.55€/night and guest during the low season and 2.2€/night and guest during the high season. The tax is reduced by half from the 9th day of your stay. All guests have to pay the Ecotasa, except people under 16 years. You will have to pay the deposit amount at the arrival to the owner. Guests will receive an email 7 days prior to arrival with mandatory general deposit payment information. The deposit is payable by credit card via a secure link within 24 hours after receiving the email. For more details, please contact the office using the information on the reservation confirmation received after booking. Option booking not available Please note: the rates do not include the mandatory hirers' liability insurance. This small amount is a percentage of the rental sum starting from 10 Euros per reservation.